The Nakhi or Nashi (simplified Chinese: 纳西族; traditional Chinese: 納西族; pinyin: Nàxī zú; endonym: ¹na²khi) are an ethnic group inhabiting the foothills of the Himalayas in the northwestern part of Yunnan Province, as well as the southwestern part of Sichuan Province in China. The Nashi are thought to have come originally from northwestern China, migrating south toward Tibetan populated regions, and usually inhabiting the most fertile river-side land, driving the other competing tribes farther up the hillsides onto less fertile land. The Nashi, along with Bai and Tibetans, traded over the dangerous overland trading links with Lhasa and India, on the so-called Tea and Horse Caravan routes. They were brought to the attention of the Western world by two men: the American botanist Joseph Rock and the Russian traveller and writer Peter Goullart, both of whom lived in Lijiang and travelled throughout the area during the early 20th century. Peter Goullart's book Forgotten Kingdom describes the life and beliefs of the Nashi and neighbouring peoples, while Joseph Rock's legacy includes diaries, maps, and photographs of the region, many of which were published in National Geographic. The two were friends and left the region together when the Communist troops came in. The Nashi form one of the 56 ethnic groups officially recognized by the People's Republic of China. The official Chinese government classification includes the Mosuo as part of the Nashi people, although neither ethnicity support this categorization. Although both groups are descendents of the Qiang people, together with the Pumi and Yi, and notwithstanding very striking resemblances between their respective languages, the two groups are now understood to be culturally distinct, the Nakhi more influenced by the very patriarchal Han Chinese culture, the Mosuo more influenced by Tibetan culture and their own matriarchal family practices. Nashi culture is largely its own native Dongba religious, literary and farming practices, influenced by the Confucian roots of Han Chinese history, and also by the group's Tibetan neighbors. Especially in the case of their musical scores, it acts as the foundation of the Nashi literature. The Nashi have their own writing, their own distinct language and their own native dress. Nashi native music is thousands of years old, and is presently being energetically kept alive by He Wen Guang, who writes and performs Nashi music in both traditional and modern styles. Another form of music, labelled Nashi ancient music by its supporters, is about 500 years old and came from Nanjing traders who were encouraged by various emperors to trade with, live in and inter-marry with the Western tribes as a way of improving controls over the unruly western regions abutting Han China. Along with the Han music are included literary lyrics, poetic topics, and musical styles which are understood to derive from themes prevalent in the Tang, Song, and Yuan dynasties. This music was played as a living tradition by the Nashi long after it was all but lost in the rest of Han China. There are three main styles, relating to the location of the music playing groups: Baisha, Dongjing, and Huangjing, all using traditional Chinese instruments. The origin of Baisha music is said to come from a gift from the first emperor of the Yuan Dynasty, Kublai Khan. On his expedition to Dali, he had difficulty crossing the Jinsha ("Golden Sand") River (a tributary to the Chang Jiang), and received help from Mailiang, the chief of the Nakhi people. To show his appreciation, Kublai Khan left half of his band and many musical scores as a gift to the chief. "Baisha Fine Music" is one of ancient China's few large-scale, classical orchestral forms of music and has twenty four tunes, locally known as qupai. Although archaic, simple, and usually very slow in style, modern Baisha music is euphonious, and sometimes even energetic in character. 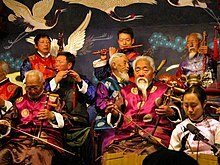 Taoist in origin, and fused with some indigenous elements, Dongjing music was introduced to the Nashi from the central plains during the Ming and Qing dynasties, and today it is the most well-preserved of the ancient musical forms in China. In addition to its intrinsic stateliness, purity, and elegance, Dongjing music has incorporated some local musical elements and styles. Originally reserved for the ceremonies of the gentry, the local passion for music resulted in enthusiastic participation by the lower classes. In a Nashi village near Lijiang. There are many arts that are native to the Nashi People, such as the rarely seen Nashi handmade embroidery, Dongba painting, Dongba wooden carving and so on. Much of the wood carving that characterizes Nashi houses are made by Bai craftsmen today. Absorbing architectural styles of the Han, Nashi houses are built in a standard Han style of one courtyard with one, two, three or four buildings around it, sometimes with linked adjoining courtyards. The mud brick and wood structures at first sight have been described as crude and simple in appearance, but a closer inspection reveals elaborate and delicate patterns on casements and doors, elegant pillars and pillar supports, and a very comfortable and airy living environment. Nashi temples are decorated on the interior with carvings on poles, arches and wall paintings that often exhibit a unique combination of dongba and Buddhist influences. The decorations include depictions of episodes from epics, dancers, warriors, animals and birds, and flowers. The mural paintings depict Dongba gods, and stylistically are derived from Han Chinese interpretations of Tibetan Buddhist themes. A good example is the Delwada Temple. Nakhi dongjing musicians in Lijiang. "There are strong arguments that support the idea that in the past the main ritual activity performed on a temporal basis was the worship of Shu nature spirits on the first days (usually on a dragon or snake day) of the second lunar month, and that this was the traditional New Year of the Naxi. In Baidi, where the old traditions have been preserved, this is the most important festival, when everybody dressed in their best clothes, gathers around the Baishuitai terrace in a festive atmosphere and pay respect to the Shu gods of nature." ... "Around the same time when the Shu Nature spirits are worshipped in Baidi, the people gather to honour Sanduo in Baisha and Lijiang."... "Worship of Heaven ceremony, celebrated some days before Worshiping Shu, is a ritual celebration to remember that Naxi ancestors came from Heaven, and that therefore they descend also from a celestial lineage." The New Year is nowadays the main festival for the Naxi of Lijiang. the New Year is considered a time of renovation for humans, their houses and their fields, a time of spiritual and physical rebirth when every person must be born again, clean and uncontaminated from the hard existence of the previous year (Ceinos 2012). According to legend, Sanduo is a war god who defends the local people. In ancient times, a hunter discovered a strange stone on Jade Dragon Mountain, and carried the stone home. On his way home, he had to put the stone down for a rest, because it was extremely heavy. When he decided to continue his trip, he could no longer lift the stone, and many thought that it was the embodiment of a god. The Nakhi later built a temple to honour this god, whom they later named Sanduo, and depicted as an immortal in a white coat and a white helmet, carrying a white spear and riding a white horse. They believed that Sanduo would protect the local people and their land. Because Sanduo was thought to have been born in the year of the Goat, it is sacrificed at his festival. Woman in traditional Nashi dress. Another woman in traditional Nashi dress. Cremation has been a tradition since ancient times, although burial was adopted in most Nashi areas during the late Qing Dynasty and remains the preferred method of disposing of the dead today. Religious scriptures are chanted at the funeral ceremony to expiate the sins of the dead. Among the Nashi in Yongning County in Yunnan and the Yanyuan County in Sichuan, there still exist remnants of the Mosuo matrilineal family structure, which was vigorously but unsuccessfully eradicated during the Communist era. As the heads of the family, a woman leaves her inheritance to her descendants either from the mother, or through her sisters and their offspring. In Nashi society, women do most of the household and farm work, and while they keep to the kitchen when guests are present, they are essential to the household and are therefore influential in family decisions. In 2005, Kuang Jianren, a famous Chinese film script writer produced "Snow Bracelet", a film based on the life of (Naxi) Nashi ethnic minorities in Yunnan. A few Nashi men carry on the ancient Chinese tradition of hunting with falcons. This practice is rarely found in other parts of China today. The Nashi have several indigenous forms of music, including baisha xiyue and the Chinese-inspired dongjing discussed above. The Nashi women wear wide-sleeved loose gowns accompanied by jackets and long trousers, tied with richly decorated belts at the waist. Sheepskin is worn over the shoulder. Especially in Ninglang County, the women wear short jackets and long skirts reaching the ground with several folds. Large black cotton turbans are worn around their heads, which are accompanied with big silver earrings. The men's costume is much like that of Han Chinese. In modern times, traditional dress is rarely worn among the younger generation. It is now usually only worn at cultural events and on special occasions. The dress of the Dongba lamas sometimes resembles that of the Bön priests of Tibet; some dongbas wear conical hats like those of the lamas of the Black Hat sect, with a piece of red cloth. The language is written with Geba script and Dongba script. The Nashi, like Mosuo, are believed to be the descendants of the nomadic proto-Qiang, an ethnic group inhabiting the Tibetan plateau since ancient times. During the Sui and Tang dynasties, the Nashi were known as the Mosha-yi, or the Moxie-yi. Frequently harassed by neighbouring tribes, the proto-Nakhi then moved southward to the banks of the Nujiang River and the Jinsha River and then to the Along River in the present-day province of Sichuan in western China. After being pushed south by other conquering tribes, the Nashi settled in the very fertile Baisha and Lijiang areas by the year 3 CE. Nashi histories describe a split into three groups while their ancestors were still in Baisha. The ones who remained are known as the Nashi, those in Dali are known as Bai, and those living around the Lugu Lake are called the Mosuo. Today, this description of the origins of the Bai and Mosuo is strenuously contested. Historians have decided that between the tenth and thirteenth centuries, agricultural production in Lijiang replaced livestock breeding as the main occupation of the people. The production of agricultural, handicraft, mineral, and livestock products led to considerable prosperity, and during this period a number of slave-owning groups in Ninglang, Lijiang, and Weixi counties developed into a feudal caste of lords. Tibetan Buddhism took hold in the Lijiang region following visits from the Karmapas from the fourteenth century onwards. In 1278, the Yuan Dynasty established the Lijiang Prefecture, which represented the imperial court in Yunnan. A chieftain, Mude, was made the hereditary chieftain of Lijiang Prefecture, exercising control over the Nashi people and other ethnic groups (particularly the Eastern Tibetans inhabiting the region of Kham) during the Ming Dynasty. The hereditary chieftains from the Mu family collected taxes and tribute, which then went to the Ming court in the form of silver and grains. The Ming relied on the Mu family as the mainstay for the control of the people of various ethnic groups in northwestern Yunnan Province. In 1723, during the Qing Dynasty, hereditary local chieftains in the Lijiang area were replaced by court officials, and the Mu chieftains were included in this group retaining position as local administrators. The ancient Nashi town of Lijiang is now a major tourist destination. In the old town, the Nashi rent buildings to Han merchants who run shops catering to tourists. The Nashi are traditionally led by their native dongbas in matters pertaining to religion. Through both Han Chinese and Tibetan cultural influences, Tibetan Buddhism has gained widespread respect (especially in the case of the Mosuo). Taoism, and particularly its "fengshui" practices have been widely practiced since the tenth century. Old guest-house in Li Jiang, built around the beginning of the 20th century. The motifs and scripts made by pebble mosaic represent ancient Naxi beliefs in symbols and writing. Dongba religion was rooted in the beliefs of the Tibetan Bön religion; the word "Dongba" literally means "wise man" in the Nakhi language. Historians have traced origins to a Bön shaman from eastern Tibet named Dongba Shilo, who lived in a cave near Baishuitai 900 years ago. According to Nashi legends, he was said to have created the Lijiang Mural. Anthropologists claim that many of the Dongba rituals show strong influences from the Bön religion, and are not native in origin. Bön lamas are believed to have settled among the Nashi as farmers, and to have begun to practise exorcisms as a way of earning a little money on the side; they were thus in competition with the native ritual specialists, locally known as Llü-bu, or Ssan-nyi. This is disputed, largely because the Bon religion is so adulterated by Tibetan Buddhism today that it is difficult to find pure and authentic practitioners to use as a basis for comparison. Religious scriptures suggest that the Llü-bu were female shamans who practised divination, exorcism, and other rites in a trance. By the early nineteenth century, the Dongba priests had created a huge religious vocabulary accompanied by a variety of rituals, and had largely displaced the Llü-bu. This is certainly the case with Yi shamans, but the connection to dongba practices remains unclear. Adherents of Dongba had no places of worship, and so they were not officially recognized as a religion by the Communists following their arrival to the region. A Dongba shaman is merely a part-time practitioner priest, who is literate in Dongba religious texts that were unreadable by most Nashi, who are not usually taught to read their own language. The Dongba religion is based on the relationship between nature and man. In Dongba mythology, "Nature" and "Man" are half-brothers, having different mothers. According to the villagers of Shu Ming Village, nature is controlled by spirits called "Shv". These gods are depicted as human-snake chimeras. The Dongba priests practice rituals such as the "Shv Gu" to appease these spirits and prevent their anger from boiling into natural disasters such as earthquakes and droughts. Before communist rule in China, many villages still had shrines or places of worship dedicated to nature gods, such as Shu. Nakhi inhabitants of Tacheng, which is in the Lijiang-Nakhi Autonomous county, still profess belief in the "nature and man" relationship. Their attitude towards nature is clearly illustrated by the story of He Shun, a Dongba priest, who forbade his three sons to cut down more trees than they personally needed, as this would anger the gods and bring misfortune to his family. One of the most widely practised Dongba rituals, Zzerq Ciul Zhuaq (literally, to repay the debts of a tree), has been described in the village of Shuming. The ritual was conducted if somebody was stricken with illness or bad luck, when a Dongba priest would be consulted. On many occasions, the result would show that the person had carried out logging or washing of dirty things in the forest, and the family or person concerned would have to ask the Dongba priest to hold the ritual near where the activity had taken place, and apologise to the nature god Shu. The elders, locally known as Lao Min (老民), would watch all these activities. The elders also voluntarily carried out the public affairs of the village. Traditionally, they played an important role, which still influences many villages. Especially in Longquan, the villagers have traditional regulations for logging and firewood collection. Known as Jjuq-ssaiq or Jjuq-Hal-Keel by the local people, this refers to the regular logging of trees and firewood every two to three years in the forested area near the particular village. A group of people comprising the Lao Min, the village headman, and the mountain guards will organise the procedure in advance. Even in recent years, Nashi villages still retain an organisation that protects the forests. This organisation is administered by the members of the village committee, which necessarily includes the heads of the agricultural Productive Cooperatives, the members of the female union, and the village mountain guard. Until the communists came to power in China in 1949, villagers followed these traditional principles and tried to use the natural resources conservatively, with thought for the preservation of the natural resources for future generations. However, after 1949 serious cultural and social change came to the Nashi, and the government encouraged logging by the Han army in Nashi areas, which in turn led to a loss of influence of the traditional customs. Many of the Nashi embrace the Kagyu lineage of Tibetan Buddhism, resulting from the presence of the eighth and the tenth Karmapas in the Lijiang area during the fourteenth century. Over the years, the Nashi in Lijiang built Buddhist Gompas, which acted as the place of worship for the Nashi Buddhist community. The first monastery, Ogmin Namling at Lashiba, was founded by the tenth Karmapa, Chöying Dorje. Religious Mani stones can also be found in some of the Nashi households. The Nashi king inviting the eighth Karmapa, Mikyö Dorje to Lijiang in 1516. The king, worried about the safety of the Karmapa on his long journey to Lijiang, dispatched an army of four generals and ten thousand soldiers to accompany him. On the third day of the fourth month, the Karmapa reached the border between Tibet and the Nashi kingdom. Accompanied by his brother and his uncle, who were both riding elephants and escorted by many riders on horseback, the Nashi king, riding on a palanquin, received them with this magnificent welcome. The king prostrated himself before the Karmapa, the elephants broke their tethers and bowed down three times before him, and raised their trunks to the sky trumpeting loud as thunderclaps. ^ China and Nepal, Backcountry . ^ Mette Halskov Hansen: Lessons in Being Chinese: Minority Education and Ethnic Identity in Southwest China. University of Washington Press, 1999, page 25. ^ Haibo Yu: Identity and Schooling Among the Naxi: Becoming Chinese with Naxi Identity. Rowman & Littlefield, 2010, page 30. Oppitz, Michael (1997). Naxi. Dinge, Mythen, Piktogramme [Nashi. Objects, myths, pictograms] (in German). Zürich: Völkerkundemuseum [Ethnology Museum]. Wikimedia Commons has media related to Naxi. This page was last edited on 10 November 2018, at 23:30 (UTC).